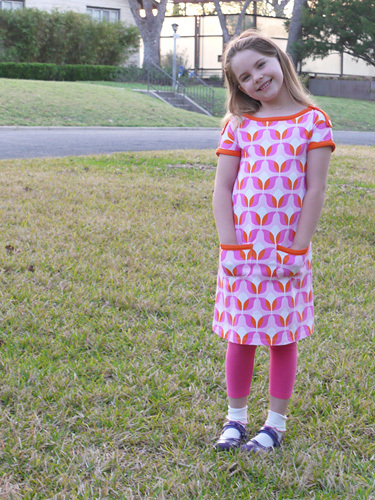 greatjencreations: Heidi & Finn PlayDay Dress. This time of year, my kids seem to want to play outside all day. So when I found a new Heidi & Finn pattern in big girl sizes (love that!) called the PlayDay Dress, I knew I had to buy it. 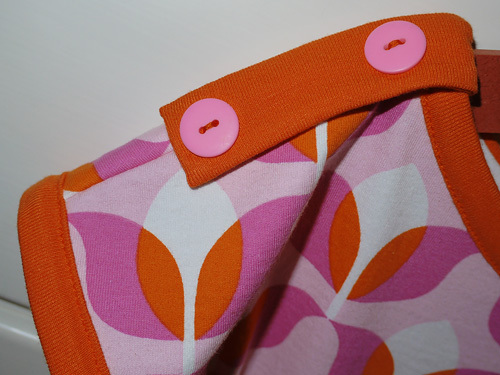 Although most of the examples I could find of this dress were in solids or very minimal prints, I pulled some Chez Ami knit fabric out of my closet﻿ and decided the pattern style was perfect for a 1960s retro look (Mad Men, anyone?). I'd been meaning to try out Kitschy Coo's knit binding method for ages, and this seemed like the perfect opportunity. It worked beautifully, and I love how it hides the raw edges and gives such a clean, tidy look on both sides. I did find that it can create a bit of bulk at seams (mostly where the edges of the pockets fold over), but it wasn't anything my trusty Pfaff couldn't deal with. I love the shoulder detail on this dress. It's easy to do, gives the opportunity to use fun buttons without messing with buttonholes, covers the bulky seam, and seems to transform a dress that might otherwise look like a nightgown into a fun retro shift dress. 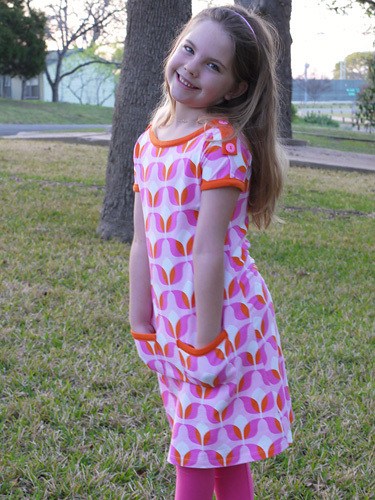 I made the size 8 for my six-year-old because she's enormous. It fits just right. She loves the pockets. Actually, I do too. Huge thumbs up for this pattern. I definitely plan to make more PlayDay dresses. I might even try coverstitch binding on the next one. Adorable and looks so comfy!